An unmanned Orbital ATK Cygnus spacecraft is seen at the International Space Station on Dec. 9, 2015 just before it is captured by the station's robotic arm. The spacecraft is carrying nearly 4 tons of supplies for the station's crew. An unmanned Orbital ATK cargo ship filled with tons of vital supplies for the International Space Station arrived at the orbiting lab early Wednesday (Dec. 9) where it was captured by a robotic arm weilded by the station's astronaut crew. 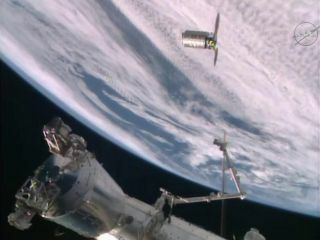 The Orbital ATK Cygnus spacecraft arrived at the space station at 6:19 a.m. EST (1119 GMT), where it was grappled in space by the outpost's Canadarm2 robotic arm under the control of NASA astronaut Kjell Lindgren, with station commander Scott Kelly - also of NASA - keeping watch. The astronauts are expected to attach the craft to a berth on the Earth-facing side of the station's Unity module by 9:45 a.m. EST (1445 GMT). Mission controllers delayed the launch by three days due to bad weather over its launchpad at Florida's Cape Canaveral Air Force Station, putting Cygnus' journey to the station just within the window the crew had available to berth the craft. If Cygnus had arrived after Dec. 9, the craft would have been held on the robotic arm until the crew had the time available to berth Cygnus with the ship, explained Frank Culbertson, Orbital ATK Space Systems Group president, at a post-launch press conference. The craft's arrival arrival heralds Orbital ATK's return to flight after its previous supply mission, using the company's Antares rocket, exploded during launch in October 2014 . This is Orbital ATK's fourth delivery mission to the space station out of an eight-delivery contract with NASA, and its first with a new, expanded version of Cygnus that has 25 percent more storage space. The astronauts will bring aboard more than 7,700 lbs. (3,500 kilograms) of supplies, over one-third consisting of components for research experiments. After about a month, the craft will return to burn up in Earth's atmosphere, carrying 3,000 lbs. (1,360 kg) of trash. Cygnus' cargo includes a life sciences module to incubate and study small organisms' growth in space, an experiment to study how gases and liquids move through porous material in microgravity, supplies to test flame-resistant and flame-retardant materials, and a set of two cubesats that will practice taking measurements of space in tandem. The craft will also bring student experiments, a safety jetpack, nitrogen and oxygen tanks, as well as two Microsoft HoloLens sets. The Atlas V rocket's extra lift power allowed Orbital ATK to pack even more supplies into the delivery than just the expanded craft, sending up almost as much as in the two previous successful Cygnus deliveries combined. The next Cygnus launched to the space station, scheduled for March, will also fly on an Atlas V rocket. After that, Orbital ATK hopes to use its revamped Antares rocket. The space station will be a busy spot for visiting spacecraft over the next month. First, Lindgren, Japanese astronaut Kimiya Yui and Russian cosmonaut Mikhail Kornienko will leave for Earth Dec. 11, and then NASA's Tim Kopra, British astronaut Tim Peake and cosmonaut Yuri Malenchenko will arrive on Dec. 15. A Russian supply spacecraft will arrive on Dec. 23. Kelly and Kornienko will finish their ongoing yearlong space mission in March and return to Earth along with cosmonaut Sergey Volkov, who arrived in September. Besides Orbital ATK, NASA has also contracted SpaceX to deliver space station supplies, for at least 12 supply missions total. SpaceX's seventh mission failed in June, but the company should be returning to flight with a delivery in January.